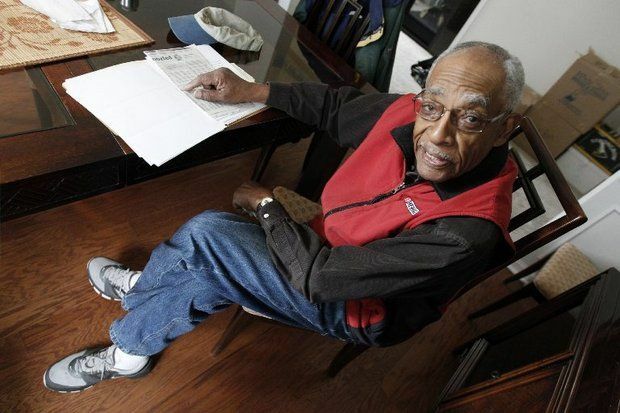 James Clark decided it was time to clean house. Clark needed a large steel garbage bin. He checked the Yellow Pages, and he said he called Dumpster Central on July 3. Delivery was scheduled for July 7, but when the delivery came, there was a problem. The delivering company wasn’t Dumpster Central, but another firm. Still, the driver removed the container, Clark said. The next day, another of the correct size was delivered by Sancon Services of Newark. The Sancon driver asked for an immediate payment of $642, Clark said. Clark said he explained that he already paid Dumpster Central, but the driver said he couldn’t leave the bin without the fee. With so much to do before the move, Clark decided to pay, again with his Visa card, figuring he’d work it out with the corporate offices. Next, Clark said, he called Sancon Services. 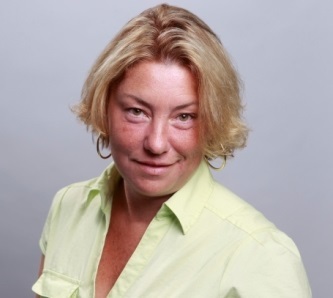 The dispatcher explained that Sancon works as a subcontractor for Dumpster Central, and that Clark should call that company to get his first payment of $504.40 back, Clark said. So on July 17, Clark called Dumpster Central, explaining to a rep that he paid twice for the bin. The rep sent Clark’s call to the finance office. Clark said he called the finance rep again on July 21, July 23 and July 30, and each time, the rep said it the refund would come. So Clark waited. And waited. And nothing happened. On Sept. 11, he said, he called again. This time he was told something different by yet another rep.
“Now I was informed that since the 80-yarder was returned, there would be a $150 fee, and the balance owed to me would be $354.40,” Clark said. Clark didn’t think that was right because the large bin wasn’t what he asked for. It wasn’t his error. So Clark tried Sancon again. Clark said he never even knew Sancon existed until the delivery, so he was very confused. He asked Bamboozled for help. We took a look at both companies. Dumpster Central’s web site boasts nationwide deliveries, and its address of record is in Boynton Beach, Fla. It offers a toll-free number. The ad found by Clark used a Rockville Center, N.Y. address with a phone number that has a 516-area code. Long Island, N.Y.
Dialing the 516-number brings consumers to the same place as the toll-free number offered on the company’s web site. The Better Business Bureau gives Dumpster Central an “F” rating. 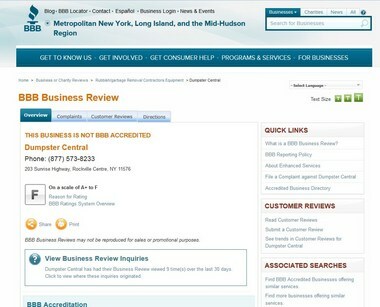 The Better Business Bureau lists the N.Y. address for the company, and it’s given a rating of “F” to Dumpster Central. That’s because the company has received 35 complaints in the last three years, and 22 of those went unanswered by the company, the BBB said. Public records show the company is registered in Florida, but not in New Jersey or New York. The Florida filing lists Cory Hecht as the company’s registered agent, but it’s not clear if that person is the company owner. But Hecht’s name — as the president of the firm — is all over consumer complaints about Dumpster Central filed with Florida. Florida shared with us its complaints from consumers in Wisconsin, Georgia, North Carolina, West Virginia, Colorado, Montana and Florida. All the consumers complained about billing practices, including promised refunds that were not delivered. They also complained about a general lack of response from the company, and reps who would hang up on the customers, records show. 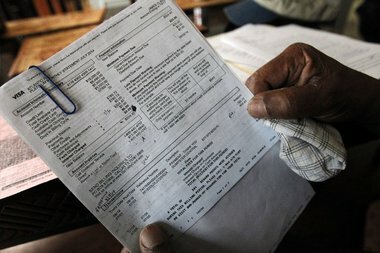 New Jersey’s Division of Consumer Affairs had no complaints on record, and New York didn’t respond in time for publication. We spent two weeks of phone calls trying to get answers about Clark’s situation. After leaving several messages for Cory Hecht at the toll-free number over the course of a week, a rep — who would not give us her name — asked exactly why we were calling. We explained, and she asked us to hold on. 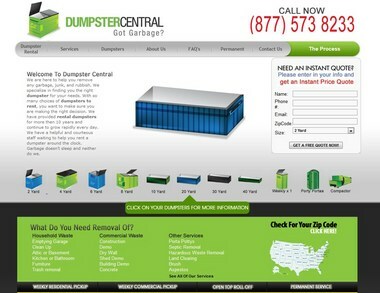 A screen capture of the Dumpster Central home page. That wasn’t what Clark claimed, we said, and we explained again about his double payment and that the wrong sized bin that was delivered the first time. We also shared that Clark said he never contacted another company for a delivery. We explained again that Clark said he ordered a 30-yarder, so there was an error when the larger one was delivered. The rep offered to take a message for Cory Hecht, so we took her up on it. But Hecht didn’t call us back. We left several more messages for Hecht, but with no response, so we tried another method, asking instead for the reps Clark said he spoke to during the ordering and refund request phone calls. None of those people were employees there, reps who answered the phone said. We then left several messages on an answering machine for Sancon. No response. We waited a few days, and tried Dumpster Central again. This time, a woman named Marie answered the phone. We asked again by name for the people Clark said he talked to, but Marie said none of them worked there. Then we asked for Cory Hecht. Marie asked why we were calling, so we gave her the whole story. She put us on hold. And she disconnected the call. So once again we tried Sancon, and we reached a rep named Joe. “Dumpster Central? I have no idea who they are,” he said, and we shared Clark’s story. 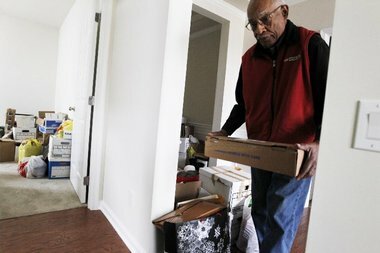 James Clark works to unpack boxes after his recent move to Howell from Short Hills. Joe said at one time, the company did take subcontracting jobs from a company that acts like a broker, but it wasn’t Dumpster Central, and that was four or five years ago. He looked into Clark’s paperwork. “It looks the same as for any of our customers,” Bill said, noting that Dumpster Central was not marked anywhere on the paperwork. He also said there was no record of a delivery of the larger container, which he said is a size their company doesn’t handle. Bill had his own theory: Maybe Dumpster Central first called a different company — the one that delivered the wrong sized one — and then later called Sancon for the 30-yarder that was delivered. And when the larger one was taken away, Bill speculated, that carrier told Dumpster Central it needed some kind of payment, which is where the $150 fee may have come in. Even if that happened, it doesn’t explain why Dumpster Central didn’t refund the other $354.40. We checked again with Clark. He insisted he never called anyone but Dumpster Central, and he said he had never heard of Sancon until the delivery happened. Clark plans to file complaints with Florida and New Jersey to see if the state’s consumer protection departments can help. He did already try to dispute the charges with his Visa card, but because Dumpster Central kept stringing him along about refunds that never came, he was too late when he finally called Visa. “I just want my money back,” Clark said.